Salt Lake City, UT. Founded May 3, 1992, by the Hellenic Cultural Association in Salt Lake City. Summary description of contents. Salt Lake City, UT. Hellenic Cultural Museum. Hellenic Cultural Library. Hellenic Historical Monument. Regional Greek American history. Documentary film information. Contact data. Description of the founding and the contents of the first Hellenic (Greek) Museum in America, with opening times and contact data. Located in Salt Lake City, Utah. This is a Hellenic Pagan Church, designed to bring community and understanding of the religion to Hellenic Pagans and Pagans alike. This group is on and off the web, and provides study help for those new to the religion. FAQ on The Gods, The Sacred Texts, The Ceremonial Texts, Festivals, Priesthood, of Hellenic Polytheism. 6 American Hellenic Institute Washington, DC. Washington, DC. Concentrates on USA relations with Greece and Cyprus and Hellenic culture. Policy statements,press releases, political action alerts, calendar of events, publications, newsletter, etc. Information about the Hellenic religion, philosophy, mythology and more, also has information from other polytheist traditions. This is a mailing list for those who want to discuss rituals, festivals, Gods and Goddess of ancient Hellas. This list is purely Hellenic, no Roman/Italic Gods, please. a not-for-profit police association for law enforcement officers and states attorneys of hellenic heritage. site includes mission statement and upcoming events. A list of people interested in Hellenic beliefs and desire to get an organization going devoted to the study and religious practice of the ancient Hellenic world, as well as to facilitate communications between HellenicPolytheists. This list is for polytheists with explorations into the myths,gods, and ancient practices as well as personal experiences. A national umbrella website coordinating local, community organizations for the preservation of Greek (Hellenic) American history. An umbrella website coordinating local organizations, and encouraging individuals, for the preservation of American Hellenic history. National umbrella web site coordinating local organizations, and encouraging individuals, for the preservation of American Hellenic (Greek American) history. Listing of affiliated groups, description of programs and events, news archives, and links to related organizations. A site to match international correspondents and to share cultural information. Foreign language specialist, cultural awareness, organizational communication and consulting, international relations, cultural liaison. Non-profit Khmer-Canadian cultural organization. Features community information, event listings, photo gallery and cultural links. Explores the history and cultural influence of the African American community. Resources and calendar of cultural events. Cultural criticism with an international scope. Offers reviews, interviews, and essays on a wide variety of cultural products and expressions. Updated daily. Discussion of the New Age as it relates to the Hellenic Tradition. Devoted to the Hellenic aspect of Thelema. Non-profit Khmer-Canadian cultural organization. Bibliography, community information, event listing, photo gallery and cultural links. A multicultural online magazine that promotes cross cultural understanding and celebrates cultural diversity. Provides articles, classifieds, and a members section. A cultural history of the TaÃƒÆ’Ã‚Â­nos of BorikÃƒÆ’Ã‚Â©n including traditions, folklore, cooking, agriculture, clothing, artifacts, and physical description. Group designed to discuss raising children in a Hellenic home. An interactive online process to promote the social aspects of cultural zionism and to empower the individual aspirations in making significant Jewish related connections. A personal account regarding the Hellenic faith, way of thought and life, under the light of the divine Olympus. provides newsletter, overview and membership information. If the business hours of Hellenic Cultural Museum in may vary on holidays like Valentine’s Day, Washington’s Birthday, St. Patrick’s Day, Easter, Easter eve and Mother’s day. We display standard opening hours and price ranges in our profile site. We recommend to check out pahh.com/hca/museum.html for further information. 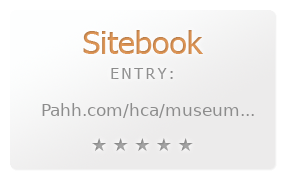 You can also search for Alternatives for pahh.com/hca/museum.html on our Review Site Sitebook.org All trademarks are the property of their respective owners. If we should delete this entry, please send us a short E-Mail.